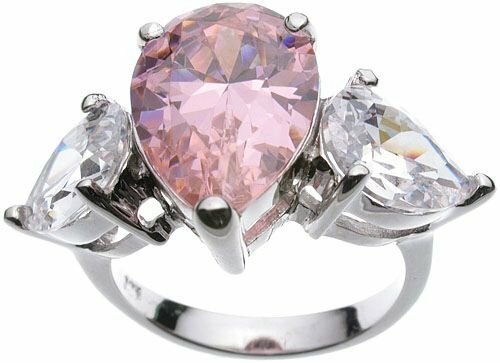 Although not a traditional Jessica Simpson ring, because of its central Pink stones, this ring has great allure. Jessica Simpson is a super star and her beautiful wedding ring matches her radiant beauty. This ring is replica of her famous wedding ring. This is Rhodium plated over base metal. it has one 10x12mm pear Pink CZ center stone and 2 pear shape 5x7mm CZs. All stones are in a trio configuration also making this ring perfect for a Past, Present, and Future ring! The Pink stone speaking of Love eternal at the center of life!